The Single Port Access (SPATM) technique utilizes the umbilicus as a single portal of entry into the abdominal cavity. The goal of this access technique is to maintain the current, safe dissection of standard multiport laparoscopic cholecystectomy while performing the entire operation through one incision concealed within the umbilicus. The critical view is a proven paradigm of safe dissection of the cystic duct during laparoscopic cholecystectomy. 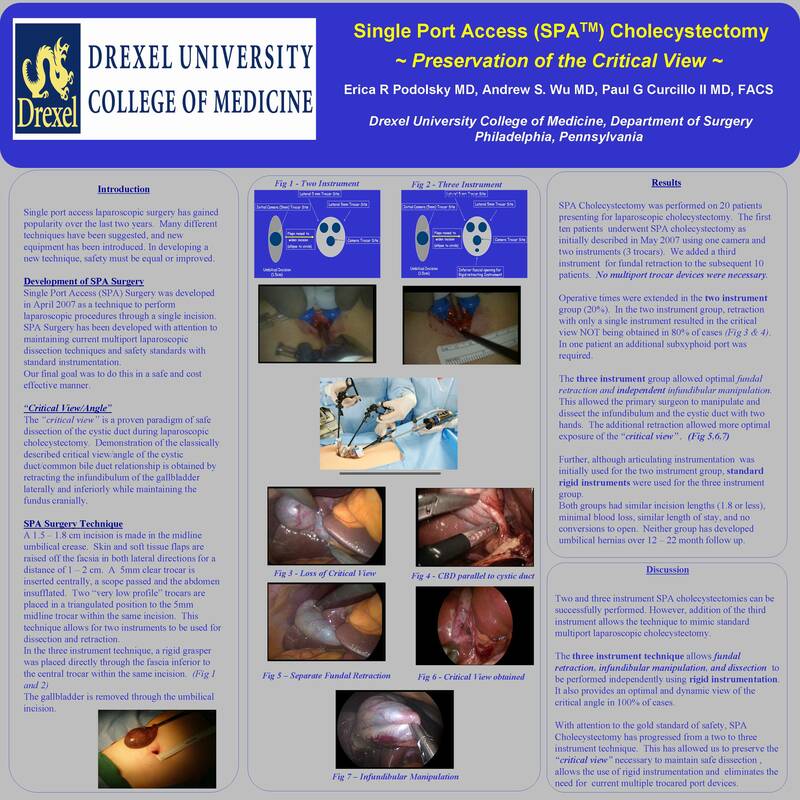 In May 2007 we performed our first SPA cholecystectomy at Drexel University. Initially, two articulating or one articulating and one rigid instrument were used for retraction and dissection. Over the first year of experience we introduced a third instrument, a rigid grasper for fundal retraction, and began using all rigid instrumentation. We present a comparison of 10 two instrument SPA cholecystectomies to 10 three instrument SPA cholecystectomies. Data was collected from 10 consecutive two instrument and 10 consecutive three instrument SPA cholecystectomies. Articulating instruments were used for the two instrument group. Standard rigid instruments were used for the three instrument group. All procedures in both groups were performed through a 1.8cm or less umbilical incision. Operative times were extended in the two instrument group. In the two instrument group retraction was more difficult to maintain. In one patient an additional subxyphoid port was required. The three instrument group provided optimal fundal retraction and infundibular manipulation independent of one another. This allowed the primary surgeon to manipulate and dissect the infundibulum and the cystic duct with two hands. Further, the additional retraction clearly allowed more optimal exposure of the “critical view.” Both groups had similar incision lengths (1.8 or less), minimal blood loss, similar length of stay, and no conversions to open. Neither group has developed umbilical hernias over 9-18 month follow up. Two and three instrument SPA cholecystectomies can successfully performed. However, the addition of a dedicated fundal retracing instrument consistently provided the important “critical view” necessary for safe dissection. The three instrument SPA technique better reproduces the standard dissection technique of a multiport cholecystectomy.